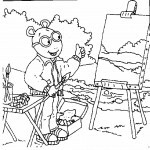 Welcome to our Arthur coloring pages. 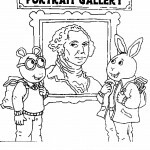 Arthur Timothy Read is the title character of both the book series and the PBS children’s television show Arthur which was created by Marc Brown. On the show, he is eight years old, in Mr. Ratburn’s third grade class, and lives in Elwood City. Arthur was ranked #26 on TV Guide’s 50 greatest cartoon characters of all time. 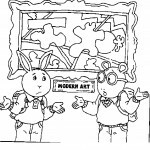 Arthur is an eight-year-old male anthropomorphic aardvark, and the star of the self-titled TV series and books. Though he is proclaimed to be an aardvark, many of his features sit in stark contrast with this. For example his small, rounded ears, large, bulbous snout and his lack of the large, conspicuous tail which aardvarks typically possess. His trademarks include his bright yellow sweater, blue jeans, big round glasses, and red-and-white sneakers that he wears in most appearances. According to creator Marc Brown, he is supposed to be a representation of the average American third-grader and is based on the author’s own experiences growing up in Erie, Pennsylvania as a child. In the first Arthur book, Arthur’s Nose (1976), Arthur had a long nose; he therefore resembled an actual aardvark. However, his design changed over the first half dozen books; he now has a much shorter nose, and many more human features. 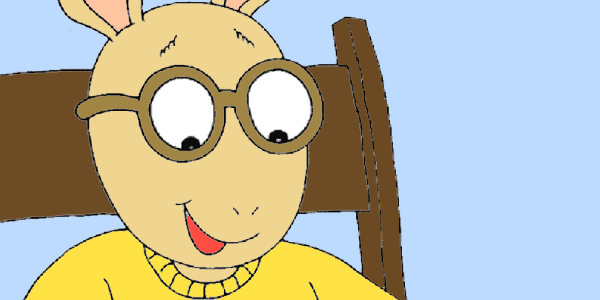 In the second book of the series, 1979’s Arthur’s Eyes (in which Arthur still very strongly resembled a real aardvark), he acquired his trademark glasses. A recurring theme in the Arthur series are the tensions between Arthur and his younger sister. Arthur is constantly pestered by his four-year-old sister Dora Winifred Read (nicknamed D.W.) and even though she celebrated her fifth birthday during the TV series’ third season, Arthur still referred to her as a “four-year-old” in the episode Return of the Snowball, which aired in the seventh season. D.W. usually tries to get Arthur into trouble, although there are times when Arthur can also be mean to D.W. or retaliate. Despite that, Arthur tries his best to ignore D.W.’s annoying antics most of the time, and often does her favors – sometimes on his parents’ behest – against his will. Arthur’s parents include his mother Jane Read, who is a work-at-home accountant and his father David L. Read, who runs a catering business. His mother is from the Pittsburgh area, and knew Fred Rogers as a child. He also has a baby sister named Kate and a pet dog named Pal. Arthur’s friends include Buster, Muffy, Francine, Binky, the Brain, and several others. Buster is his best friend who has the habit of eating junk foods continually. Muffy, who is rich, desires popularity and always wanted to start her own business. Muffy’s inspiration is her dad’s automobile business. Binky acts as the main school bully, but sometimes he couldn’t intimidate some of the students especially Sue Ellen. Brain’s true name is Alan, but his friends call him by his nickname due to his intelligence and habit of correcting others’ mistakes in many subjects. 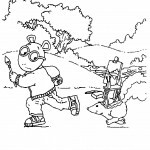 We have a few really nice Arthur coloring pages, so why don’t you give a go at it and make this little Aardvark as cool as you can?